What's the angle of incidence of the sun in ... at .... o'clock? 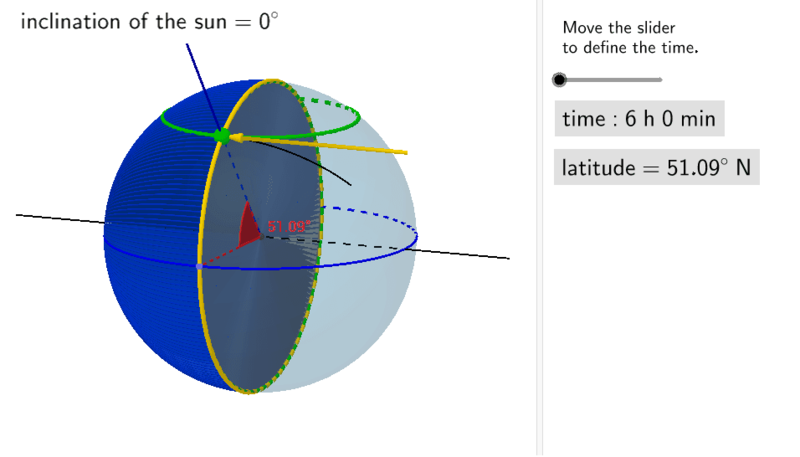 Next applet applet shows the earth on the two equinoxes (21th of march and 21th of september). The yellow meridian circle separates the parts on earth that are lightned up by the sun from those that aren't. You can modify the latitude by dragging the green point on its meridian. You can move the time by moving the slider on the right. The yellow arrow marks the angle of incidance of the sun.